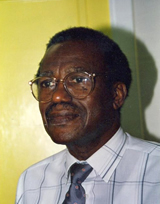 Sir Leton F Thomas, one of St Lucia’s erudite scholars was the first principal of SALCC. His career as an educator is rooted in the pupil teacher system through which he progressed swiftly and steadily. His individualistic mind and intellectual alertness were soon recognized and he was appointed supervising teacher relatively early. From then he became, Inspector of Schools, Education Officer, Chief Education Officer and Permanent Secretary. Sir Thomas’ academic qualifications include the ACP (Associate of the College of Preceptors) the LCP (Licentiate of the College of Preceptors) and the Master’s Degree from Columbia University in 1965. 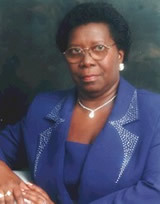 The distinguished educator has served on various regional Boards. In fact, at the time of his appointment he had been residing in Barbados where he was serving as Co-ordinator of the Caribbean Network of Educational Innovates for Development (CARNEID). This background equipped him for undertaking the onerous task of combining independent educational units into the one educational institution that it is today. With his attributes as a visionary he soon introduced new units such as the Division of Agriculture, the School of Nursing and Computer Services. No profile of Mr. Thomas is complete without reference to his accomplishments as a musician. He was Cathedral organist and choirmaster for many years and, indeed, composed the music for the St Lucia National Anthem. His crowning glory as an educator is the title of the Honorary Doctor of Letters conferred on him by the UWI at the 2003 graduation ceremony held at the St Augustine Campus, Trinidad. Congratulations, Dr Thomas! Her Excellency Dame Calliopa Pearlette Louisy was the second principal of the College. From all accounts, she was a child prodigy having obtained the Sixth Standard Primary School Leaving Certificate at the tender age of eight. As a student at SJC she amazed her peers and tutors alike by placing first at every examination. On completion of her secondary school education, Pearlette Louisy joined the staff of Saint Joseph’s Convent. She entered UWI Cave Hill Campus in 1966 to study for the BA in French and History. In her second year at Cave Hill she was awarded the title, Student of Year, on account of her intellectual achievement and her contribution to campus life. She later on entered the University of Laval Quebec to study for the Master’s in Linguistics. She joined the staff of the ‘A’ Level College in 1976 as lecturer in French, went on to become principal of the ‘A’ Level College and later, Dean, when the unit was renamed the Division of Arts, Science and General Studies. In 1991 she entered Bristol University to pursue Doctoral Studies. Two years after, she was appointed Vice Principal of SALCC and in 1997 become its first female principal. As a product of an extended family, her Excellency learnt the values of sharing and caring. In addition, she learnt to be fun loving. She is comical, loves singing, dancing and folk culture. She was a founder member of the Folk Research Centre and as a member of Mouvemen Kewyol assisted in the development of the Creole Orthography. She served for many years as St Lucia’s Representative on the Association of Francophone countries and in that capacity, attended meetings in various countries in the Caribbean, United States and various countries in Africa. Her Excellency is an inspiration to many. Her former colleagues in St Lucia and fellow educators in the region continue to express their admiration for her and are proud of her. 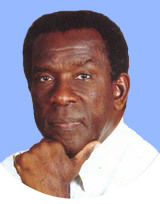 George Joseph Forde, former Principal of Sir Arthur Lewis Community College was the third person to hold the position. The story of his journey through the ranks of the pupil teacher system, to a graduate teacher to then becoming an eminent Caribbean educator is not only inspirational, but epitomizes the successful balancing of the pursuit of academic goals with full participation in extra-curricular activities. At the age of thirteen, he succeeded in the Sixth Standard Primary Leaving Certificate Examination and started his career as a pupil teacher. He progressed swiftly and by the age of nineteen, became a certificated teacher. In 1963 when he entered the Teachers’ Training College, he had already earned a number of ‘O’ Level certificates that he had steadily achieved through private study. Needless to say, he was recognized as a model student and was elected Valedictorian for his graduating class. He obtained his Advanced Level Certificates and in 1970 entered the Cave Hill Campus, UWI, to pursue a BSc in Mathematics and Economics. He was off to Duquesne, Philadelphia, in 1976 to study for the Master’s Degree and in 1985 left once more to pursue doctoral studies in Pittsburgh, USA. As a member of the Soufriere branch of the Catholic Youth Organization (CYO), George Forde participated in social, cultural and sporting activities in his community. He was, for many years, one of the organists for the Church of the Assumption in Soufriere. 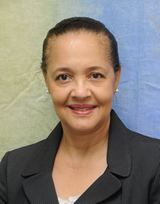 Dr. Beverley Anne Lansiquot, a St. Lucian, was the fourth Principal of the Sir Arthur Lewis Community College in Castries, St. Lucia having served as Coordinator of the Department of Health Sciences since 1998. Dr. Lansiquot completed her secondary education at the St. Joseph's Convent in St. Lucia. She then furthered her education in professional nursing earning an Associate Degree at the University of the Virgin Islands, a Bachelors Degree and Masters Degree at the University of South Florida. She recently earned her doctoral degree from Case Western Reserve University. Her first profession is nursing. She is an Advanced Practice Nurse with a clinical specialty in Mental Health and a functional specialty in Nursing Education. Dr. Lansiquot has held different professional posts in clinical nursing and administration in the USA. Her primary interest as an administrator is transformational leadership and organizational development. She was awarded a Leadership Scholarship by the Center for Disease Control and Prevention (CDC) in 2002 becoming a Scholar of the National Public Health, Leadership Institute at the University of North Carolina's School of Public Health and the Kenan-Flagler Business Institute. Her leadership skills were applied in the commissioning of the first Alcohol and Drug Detoxification & Rehabilitation Unit in St. Lucia 1988-1990. At the College she transformed the nursing programmes which are now recognized nationally, regionally and internationally.